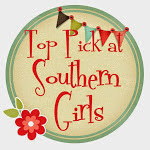 I'm excited to be here throwing my hat in the ring for the new challenge over at Anything But Cute. This month our lovely and talented hostess Niki, has chosen an amazing theme that everyone can jump in on "YOU'VE GOT HAPPY MAIL". I do hope you will all join me this month, I can't wait to see what gorgeous creations you come up with! Here's what Niki had to say about our challenge theme: "We all like Happy Mail right? That feeling of being spoiled rotten when you receive a handmade card from someone, is better than being wrapped up in a soft blanket near a fire, sipping on a hot latte. So, for this challenge I would love to see your mixed media Christmas cards, tags, ATC's or whatever you are mailing to a friend! Just make sure they are inspired by the spirit of the season!" I decided to do a card with some colours and textures inspired by the wintery outdoors. The whites and shimmers of the sparkly snow, and the purples and blues of the skies and the ice. Not your traditional Christmas colours, but wintery and frosty all the same. Hope you enjoy. I deeply apologize for not having some tutorial pics for you. There was a bit of a mix up and my memory card with the images on it, is now on vacation in North Carolina! Oops! All the layers were coated with a thick Gesso and then I smooshed a piece of acetate on the gesso while it was still wet to create the texture. A very simple yet effective technique. Dies: Simon Says Stamp - Eliza Snowflake, Memory Box - Lindeman Snowflake, Tim Holtz Tag Collection. Inks: Distress inks - Dusty Concord, Chipped Sapphire and Peacock Feathers. Mixed Media: Liquitex - Ultra Thick Gesso, DecoArt Snow Writer and Glamour Dust Crystal. 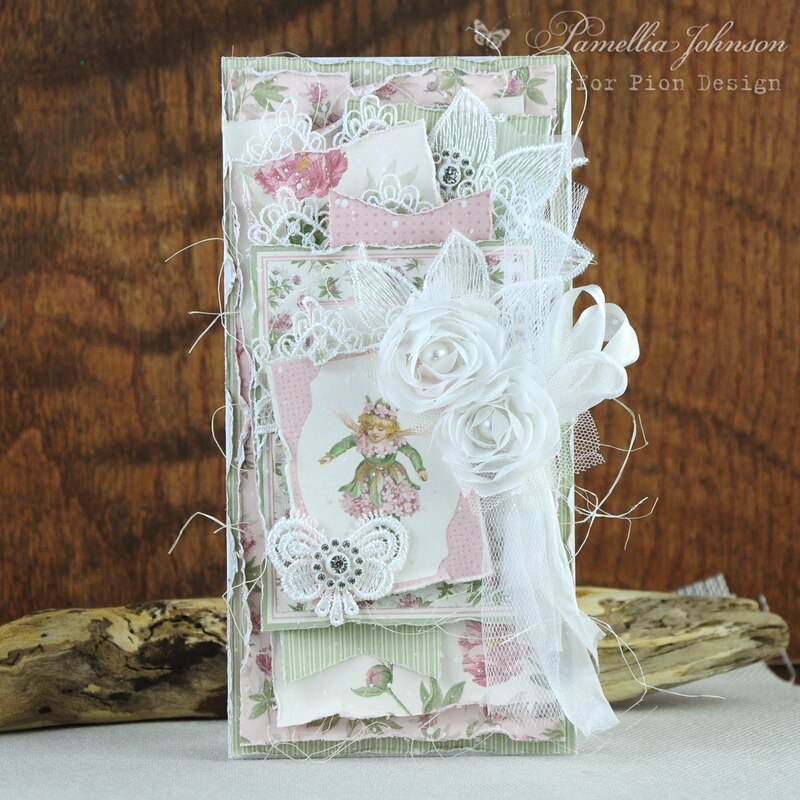 Stamps: IndigoBlu - Script stamp, BoBunny - Powder Mountain, JustRite Vintage Ornaments. 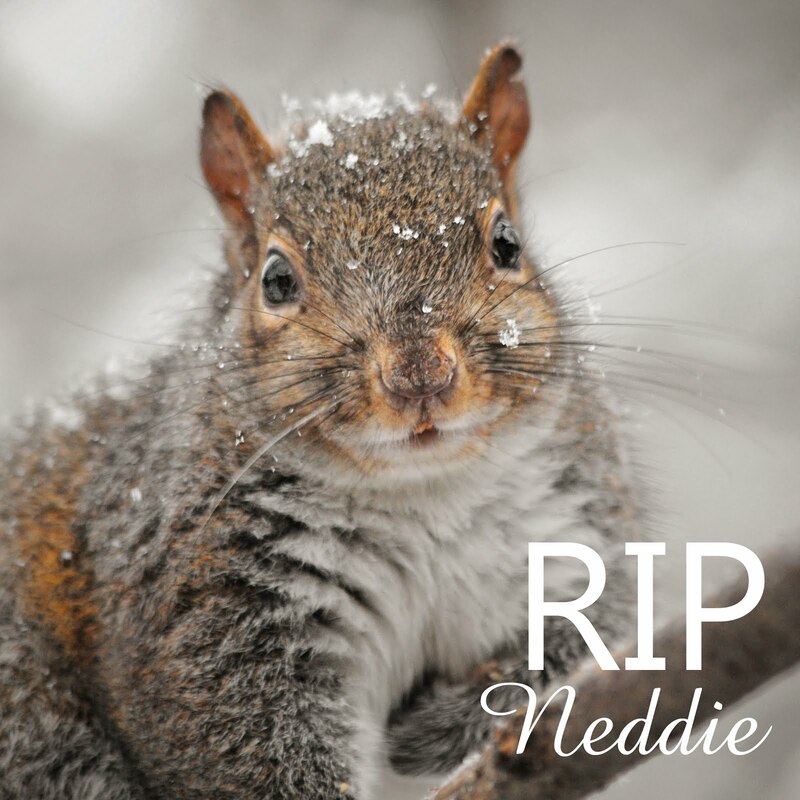 I had no luck tracking down the original source of my inspiration, but here is the Pinterest photo. Thanks to the original artist for sparking my creativity. So the weather here remains wet and overcast, but I do still manage to get outside the odd time. 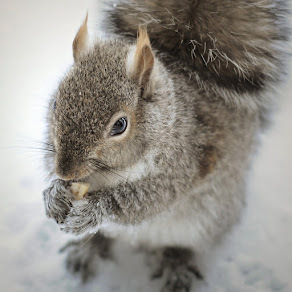 Without the snow though, I find it quite drab so here's hoping the white stuff starts falling soon!! We had this very amazing day this week when the entire world just has the loveliest blue glow about it right around dusk. Since we all know how stuck on blue I am this year, it's no surprise that I thought it would be a great opportunity for some outdoorsie type shots! I decided to decorate the balcony in front of my craft room. I know it's not very fancy, but I've never been able to have decorations outside like this before, so it's quite a treat for me! I'm totally buying more for next year!! This is how it looks from the main entrance. Let me know how it's coming with your own holiday decorating!! and your photos are very pretty! GORGEOUS..BEAUTIFUL colors and the textures with gesso WOW ! You enspire everyone with all your wonderful techniques. 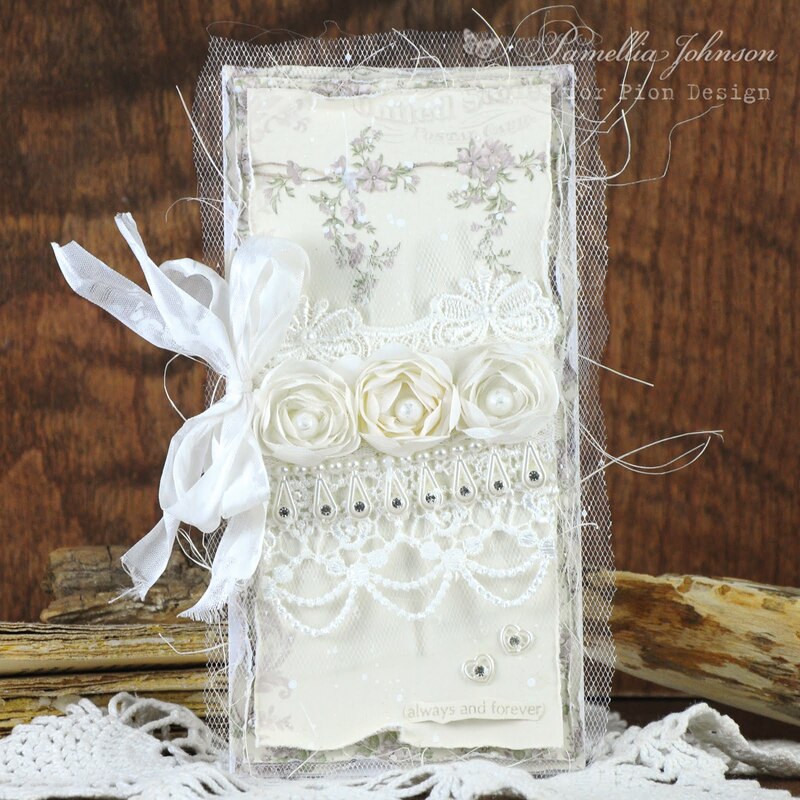 Very beautiful Christmas tag with lovely layers and embellishments. It's special to see sweet blue colour on it. I love your layering of the tags...it adds amazing dimension and such beautiful interest! And oh, those colors...they speak to me! Such an elegant icy feel to this! LOVE! Hugs!!! 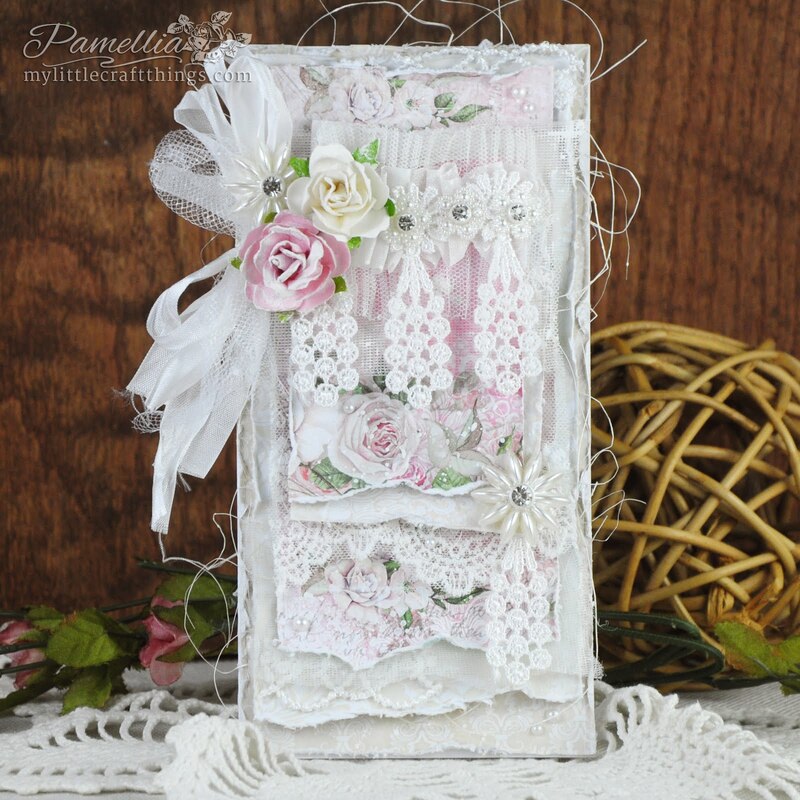 So many pretty layers, Pamellia! All those tags look amazing on the card base! Love the colors and frosty goodness. Oh and your decorations are so elegant and I am sure a pleasure to see while crafting! Happy Weekend, Hugs! 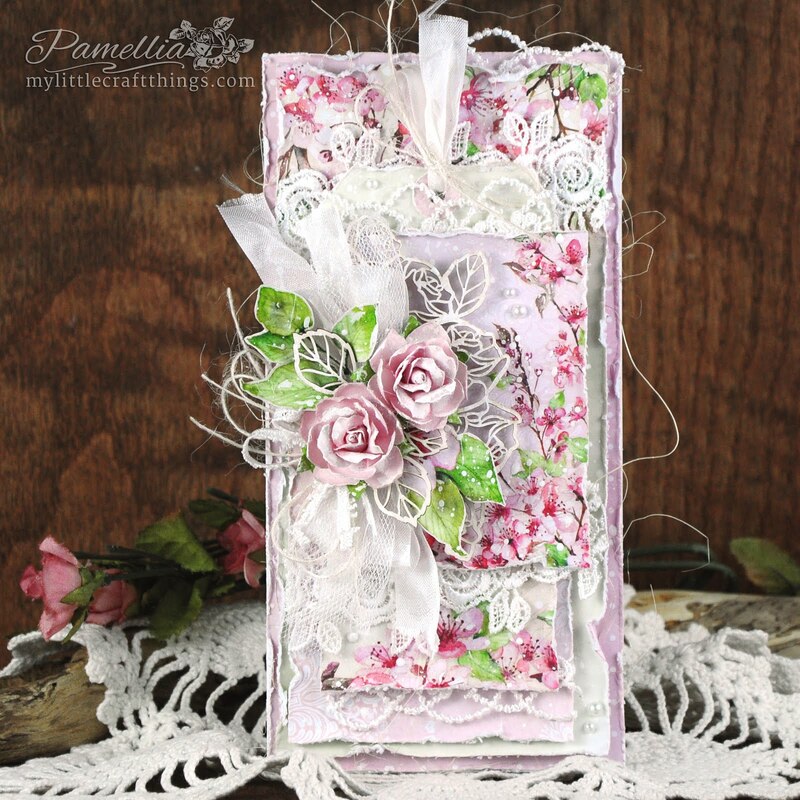 Woo the gorgeous textures and hues on your card...so inspiring Pamelia!! Beautiful tag loving all the layers and texture and soft blues . Your outside decorations are very pretty . Oh, WOW, Pamellia! 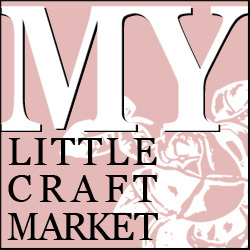 How in the WORLD do you manage to outdo your creative self each and every time you walk into your craft room? Your snowy, icy layers are just lovely; I could sit and stare for hours and not get tired of the scenery on this card! The texture you created using the gesso and acetate technique is gorgeous, and the subtle stamping on your tags just steals my heart. Good Golly, Pamellia, this just defies words, even for me! Would you let your memory card know the door is open, and it is welcome in Wilmington, NC? What in the world did you do??? As always, I so love your photography, and your balcony looks like a little slice of Heaven...you must love looking out as you create! Love the simplicity of your outdoor decor. 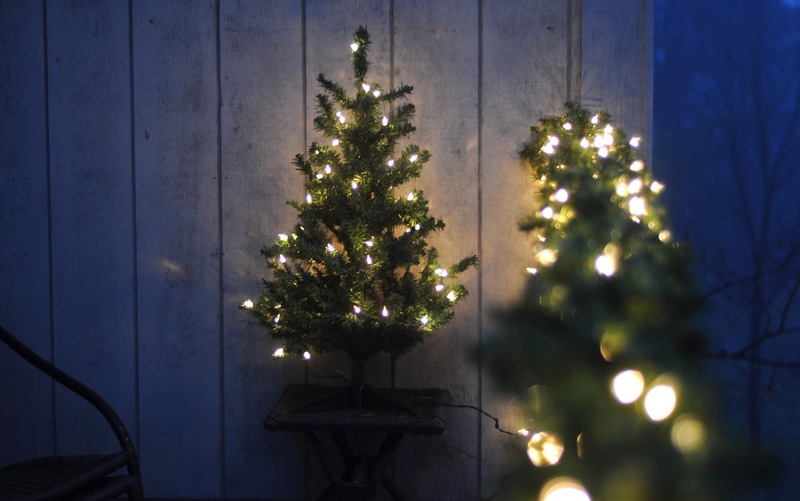 Outdoor lights are kept very simple here at Christmas, but no tree yet! Just a "few" of my favorite vintage Santas are up so far, but Lauren has big plans to decorate for her last Christmas as a high school senior setting her sights on being away at college next year. So it looks like the Christmas village is going up this year! Holding off on the tree as long as I can as I am highly allergic and no one will allow a "fake" tree in my family. Huge holiday hugs! 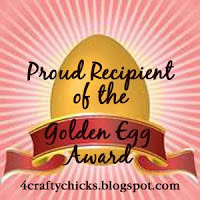 Thank you for your lovely comment on my blog, my lovely crafty friend. 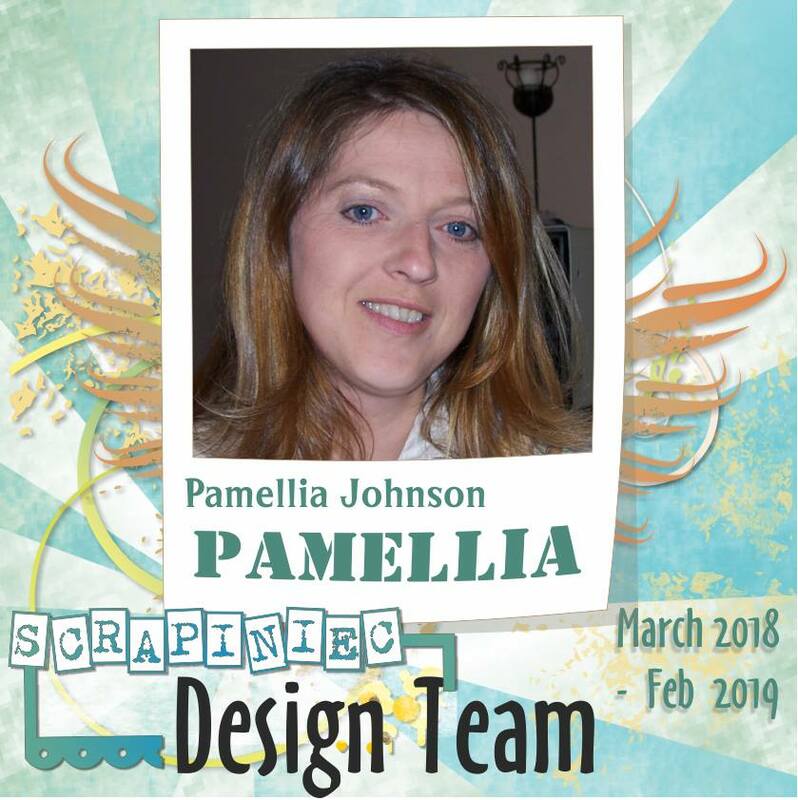 Oh my Pamellia you have won my heart not only with your wonderful photos of your little corner of the world but with your stunningly beautiful card . All those fabulous layers in such a beautiful combination of hues . So frosty and delicate ! Oh my..frosty colours..icy dripping snow..dimension and gorgeousness with sparkle and texture...beautiful Pamellia and love your photos, your are a very good photographer, with your balcony all decked out with lights, it looks so peaceful and beautiful. 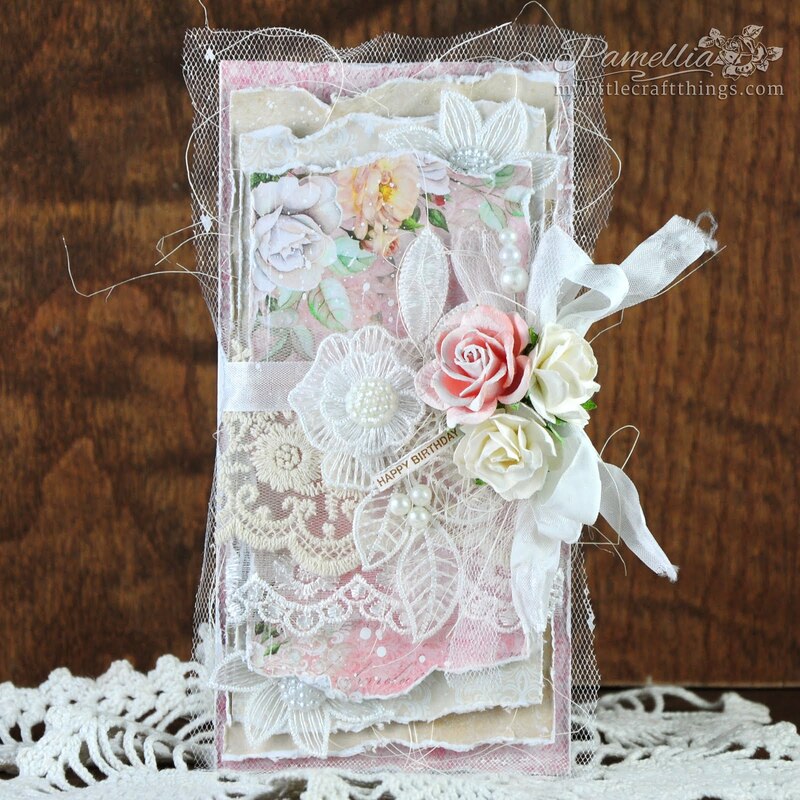 Absolutely gorgeous card, wonderful colours and texture, love all those overlapping tags and die cuts! Stunning photos too...the blue light is wonderful and your balcony looks lovely and festive. Our outdoor lights are on....sadly overshadowed by next door's amazing display....never mind, we try! A gorgeous project Pamellia, love how you are decorating outside your home. This would certainly be happy mail if this landed on my door mat Pamellia, it's so beautiful! Super frosty texture and icy blue colours are perfect for this time of year and you have captured the essence of it here. Your new home seems to have inspired your creativity even more than before I think and I look forward to each one of your beautiful creations. P.S. 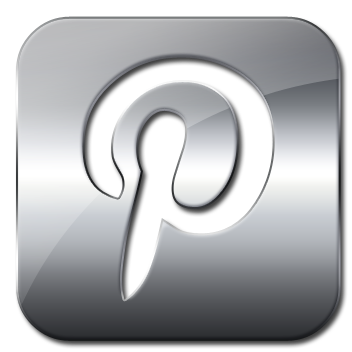 I did a bit of sleuthing and this is the link for your inspiration pin. A gorgeous project Pamellia, stunning colours and textures you have created. Love these photos you have shared, bet it looks gorgeous at night all light up. 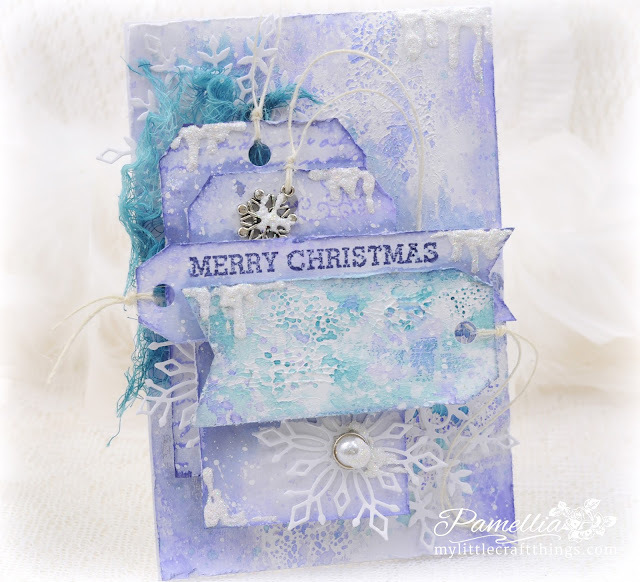 I love the wintery look of your card, Pamellia! I am longing for snow myself. I don't have a craft room so I work from my dining room table. We have a deck right off that room and I always have lights on top of the railings and a lit up snowman at Christmastime that I can view while I sit at the table--one of my favorite spots to look at! An absolute beauty of a card Pamellia. I love the arrangement of tags. The colours are wonderful and I'll have to try that technique to create the gorgeously textured background. Thanks for the tip. Very pretty! I love all of the wonderful texture and gorgeous colors. Thanks for joining us at Just Us Girls! Absolutely awesome. Love all the texture and the soft colours. So many beautiful bits and bobs for our eyes to gaze over. A real stunner. Lovely to have you join us again at Just Us Girls. Thanks Pamellia. Your outdoor Decorations look fab. Happy mail is receiving an email with you project in it. This is beautiful, frosty, wintry and just so very beautiful. Love the cheese cloth and all the texture. 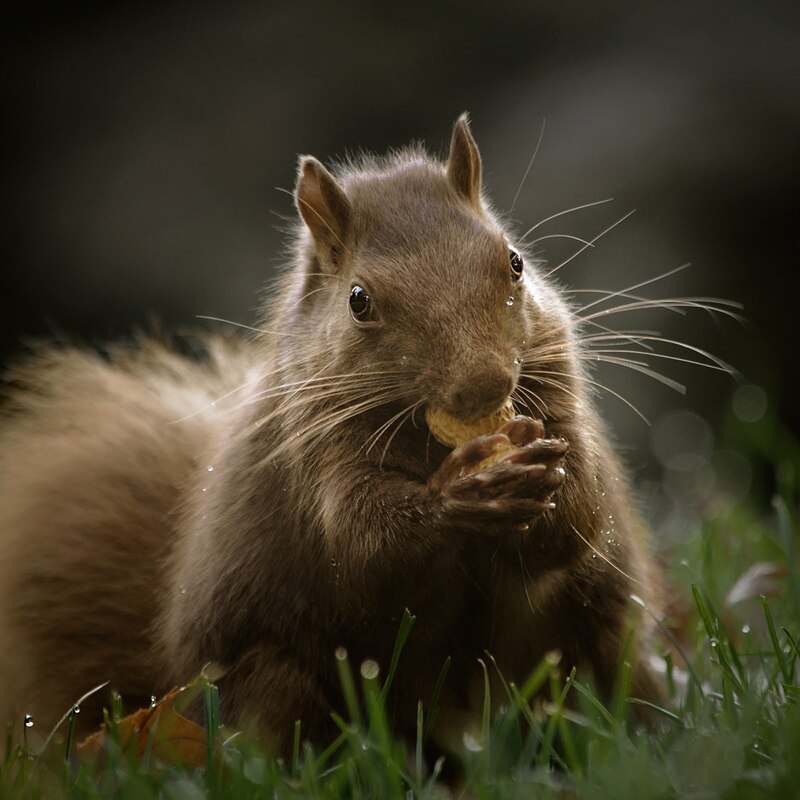 How lovely your outside looks, and your rainy photos look beautiful too, our heavy rain and winds are grey and VERY dismal. 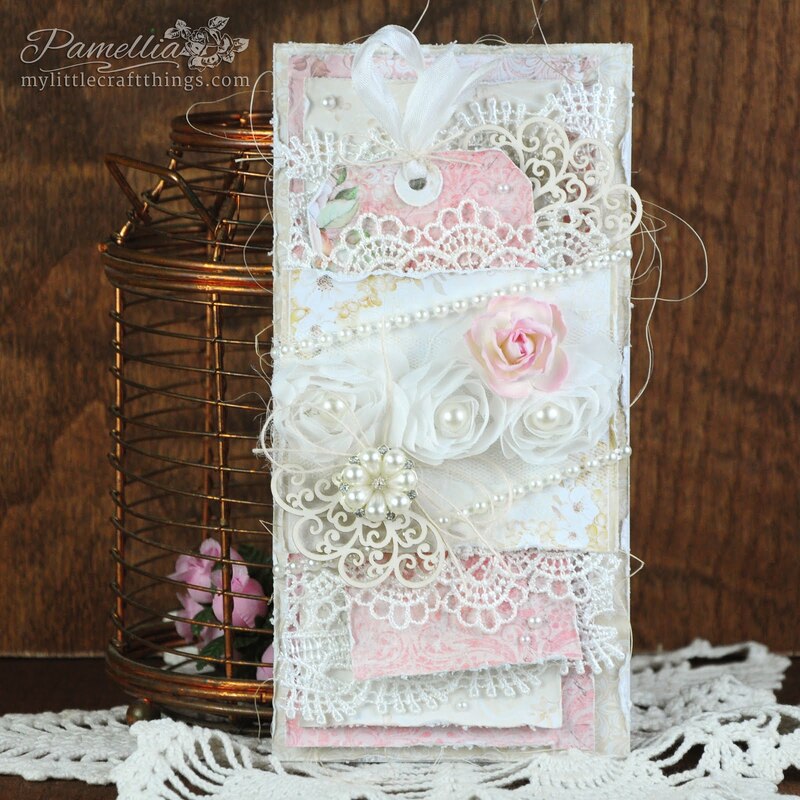 Another stunning card Pamellia, love how you layered the tags and to be honest I much prefer your softer version to your original Pinterest inspiration make. The gorgeous frosty blue tones are right up my street too! Just gorgeous!! Oh and I love the photos!!! Holy cow! I'm super impressed and so inspired to play now! this is just beautiful! Just one word Pamellia ! BREATHTAKING !!! An amazing card!!!! And your decorations are wonderful as well! 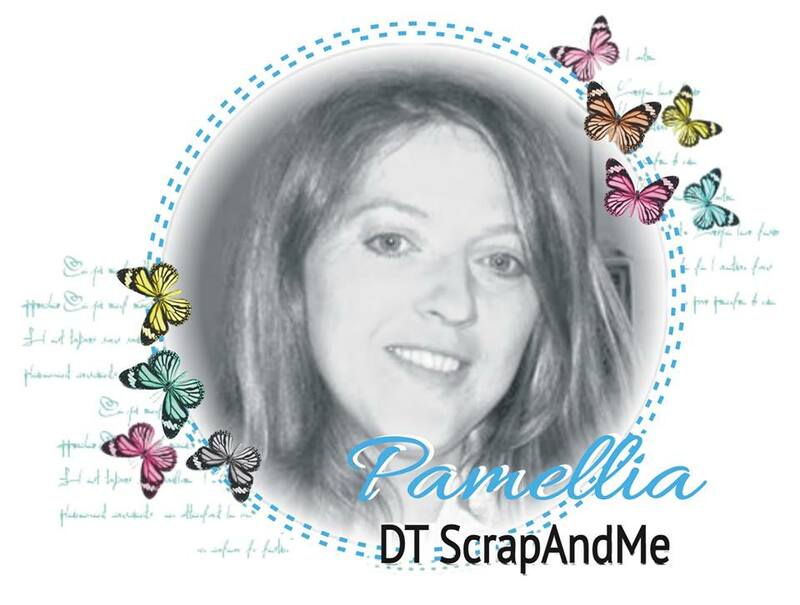 Your creation has certainly made me happy Pamellia, it's so gorgeous love the colour and the texture, love it! Fabulous make again, just love it. Cor i should have saved my last post for this theme lol! Never mind hopefully I can get time to make another. Thank you for your fabulous comments on my blog, as always you are so supportive, its very much appreciated. Now those Aquatints, here is the link http://www.crafterscompanion.co.uk/shop-by-brand-c2159/spectrum-noir-c6010/spectrum-noir-aquatints-c6550 this is from the UK though but do look in USA as I know Sara does a lot in America so you may be able to purchase them over there. Good Luck, they are lush to work with and you use so little. 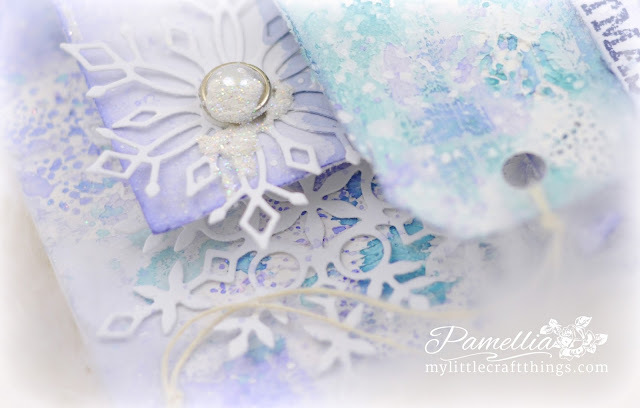 This is stunning Pamellia, such fabulous dimension and texture - beautiful winter colours and brilliant frosty details, absolutely gorgeous as always. 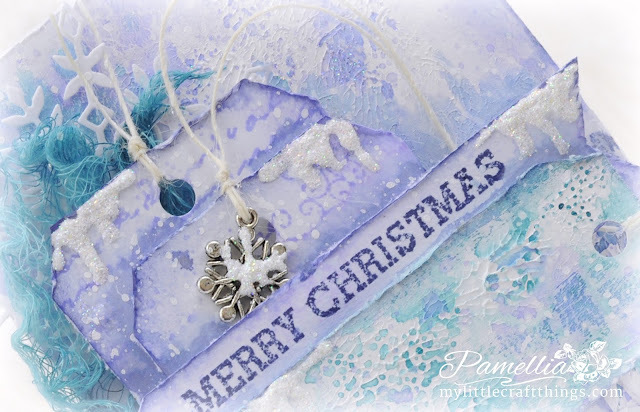 What a beautiful blue winter card Pamellia! It looks like it was left outside in a snowfall - SO pretty! 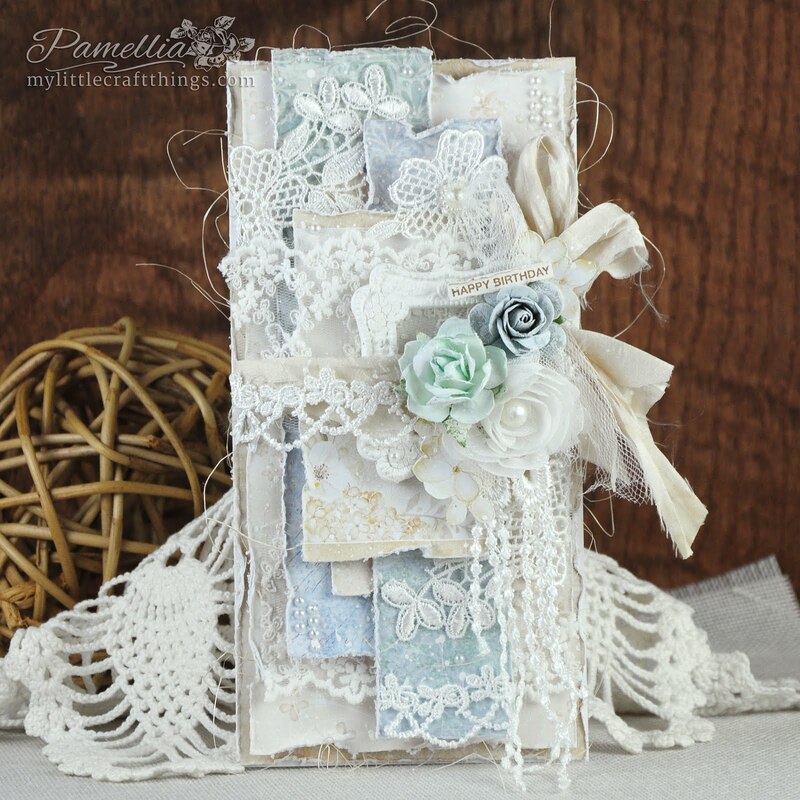 Gorgeous card Pamellia, love the various shades of blue with the white, such a frosty look. Great design with the layered tags too. Just had to come have another look! Lovely, lovely, lovely layers! So inspiring! Hugs! You are just too cute Pamellia!! Just like a little kid with your decorating- I love it!! Good for you and i am so glad that you share the photos and your joy with us!! Gorgeous choice of colors my dear! Textures and cheese cloth look great! 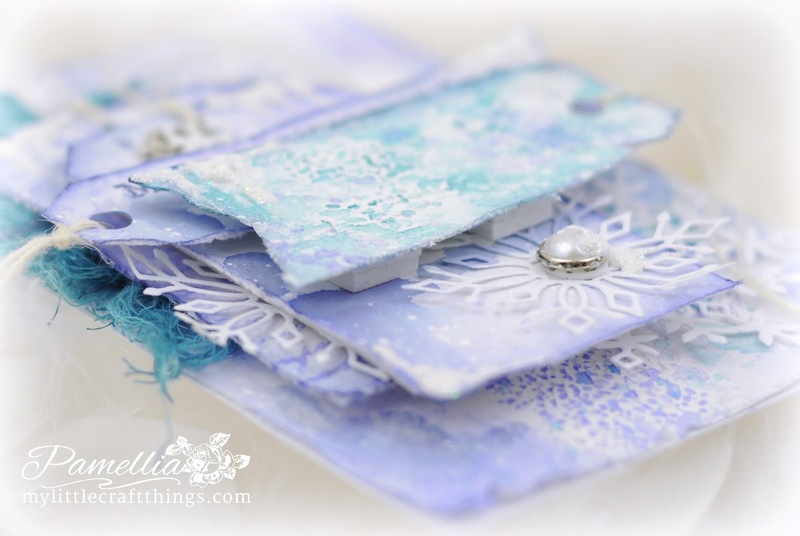 Gorgeous layout, beautiful icy patterns and colors! 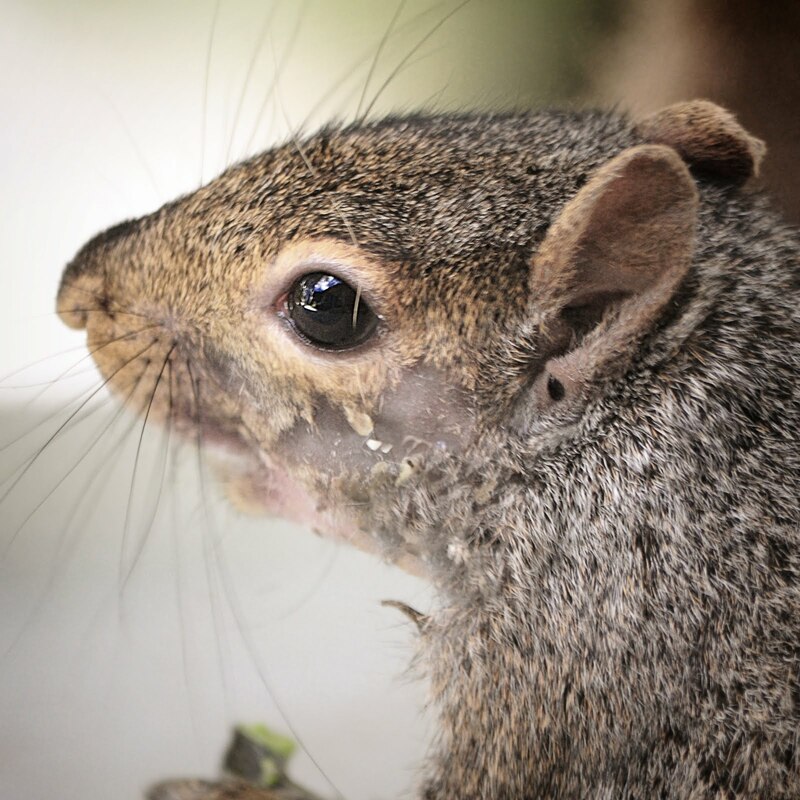 And I think your porch is so beautiful and charming! I know you must be thrilled! A new favorite! WOW!!! LOVE the texture created from the acetate! LOVE the layered tags! You are amazing! PINNED! Absolutely gorgeous card! 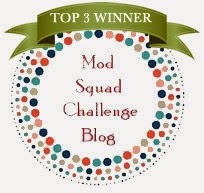 I love your brilliant layering and your decorations look amazing! Love how you are rocking your new favourite colour. All the different tags make such a beautiful card along with the various snowflakes. Gorgeous! Oh wow - your balcony is wonderful. Since it's just us old folks - we don't decorate but seeing your balcony makes me want to ask hubby to put me a string of lights outside my window Pamellia!! Loved seeing yours. It's perfect. NOW - on to your card. Somehow I missed this one. I was going back thru my emails and saw it. But hey - I'm slipping - I missed getting a prize at Colourart too - so bummed. It was when hubby had his heart attack though so I'm trying not to beat myself up too much!!! Anyway - I'm rambling. My favorite part of this BEAUTIFUL card is well - OK... TWO THINGS... the colors - ADORE THEM... and... the melting snow... love how it is just dripping down the tops!!! Now... I have only every sent one happy mail package and I didn't really get that right so.... I am going to think of who in the world to send one too and then see what I can come up with!!! FUN - you guys are always challenging me!!! 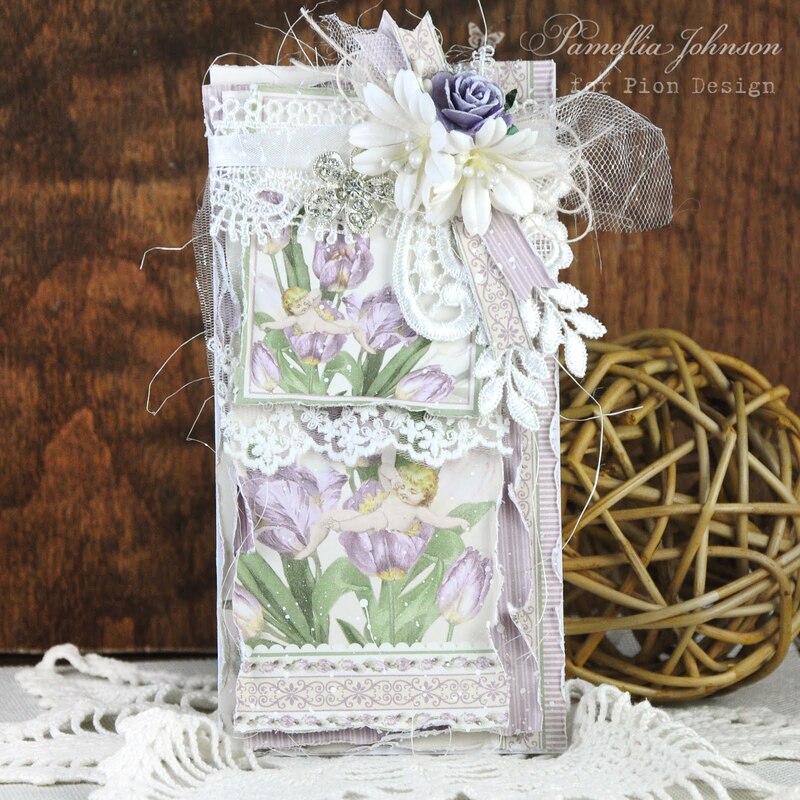 j.
Gorgeous, love the colors and the softness of this tag, and the photos are so wonderful, thanks for playing our challenge at 4 Crafty Chicks. This is absolutely stunning! Gorgeous colors and awesome design with all of the tags. Truly a work of love. Thanks for playing with us at JUGS! When I saw this card I just stared at it for a couple of moments "oh-ing" and "ah-ing". It's just soooooooooo beautiful! Stunning colours and all the details. My oh my, this must be one of my favourites. Wow, just wow, a real treat for the eyes. Well done my friend, well done! I love this card, fabulous colours and beautiful snowflakes and tags The melting snow effects look amazing. Beautiful colors -- the added "snow" is fabulous! Thanks for joining in at JUGS! Such pretty colours, and I really like the layered tags. 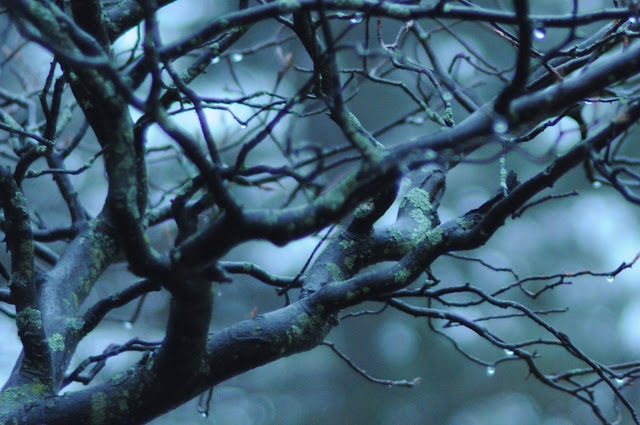 And the photos are great - especially the rain drops on the branches... better than "raindrops on roses" even! Love the colours you have chosen for this wonderful card. Definitely a frosty feel. Your craft room has a balcony.....how posh is that lol! 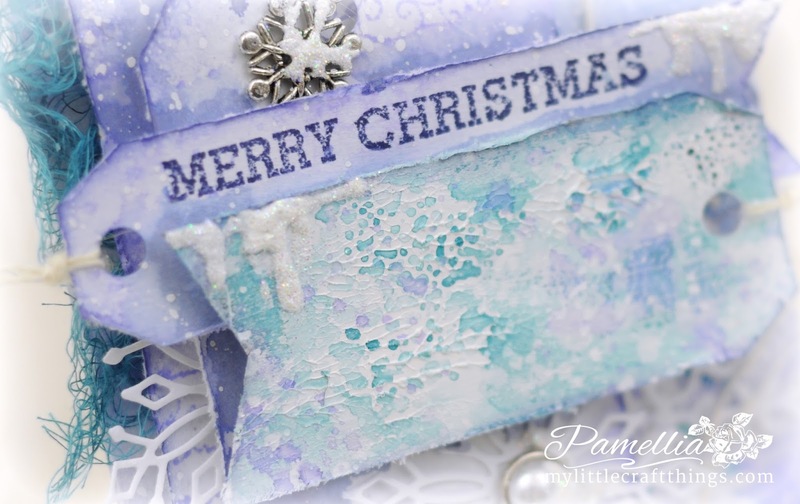 A beautiful Christmas card full of cool colours and wonderful wintry textures. Sally.x. This is the first comment I've made all year, but this tag was so spectacular I had to let you know how much I enjoyed it. Wish you hadn't lost those tutorial pixs. Thx for giving as much description as you could. Saw some other thumbnails of your work & had to figure out how to 'follow' you. 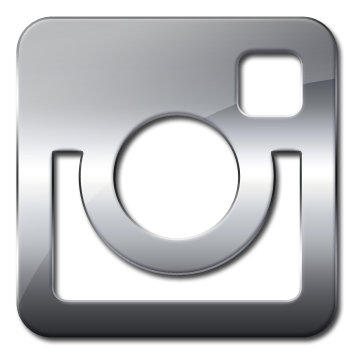 You are my first to follow. Exceptional texture and color schemes. I'm revolted by most of the color sk. 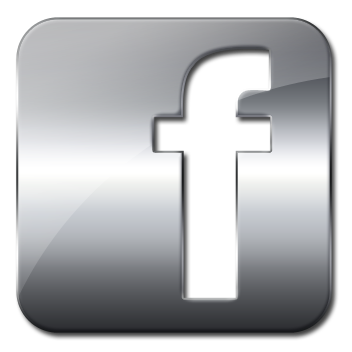 I see on the web these days & your posts are a welcome change. 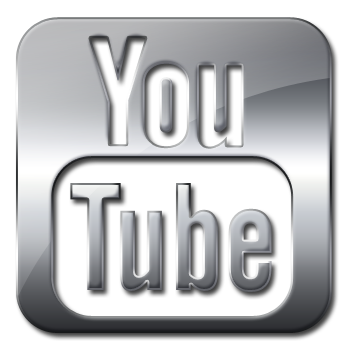 Anybody have any tricks to help me find sites that appeal to me, as picky as I am? Seems like most of the best sites are from non-US countries, that I've seen in the last 2 days of concentrated study on this problem. Purple is the New Blue!